I made screenshots of every status I had (except Fiddler and Starter). So that's how I know the date of the ranks. Sorry for those who are not in the strip. I chose the 33 most active players to make in my strip. But if you don't have a SHARED character, I can't put you in here. You reached a new level and became a DUKE. You need another 8000 points to reach the next level. sent a strip reply: "almost a publisher"
@stargazer That akward moment when you say: WHO ARE YOU!?????? I only remember friends.. Because of the notifications. I can only use elements from friends. time to smash those points down!! @scama I always know that you're just kidding. I always know. Don't worry. I'm kidding too. Yea 35.000xp is very much.. I have 24.000xp right now.. So It would take me more than 2 months to become god if I was you. You'll become god for sure! Yea it takes alot of time to put everybody in it when they don't have a completed character. Like Syke. And the second reason is that I really couldn't put more items in my library. I always take players who are on my "what's happening" page. 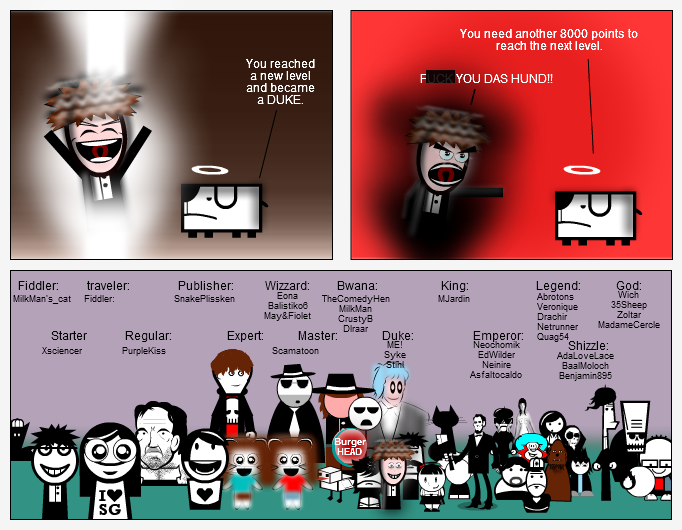 i still got 35000 points to reach GOD status, it may take a while..
anyways great strip, its great to see so many great artists in one strip!